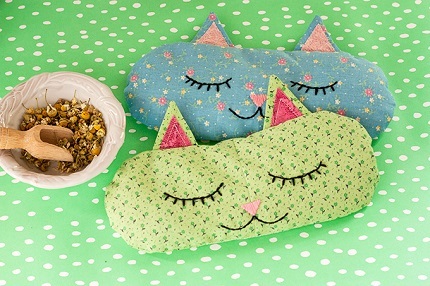 Rachel from Adventures in Making shares a free pattern to make her Cat Nap aromatherapy pillow. These little kitty pillows are sooo cute, especially made from a sweet calico print. The long thin pillow fits across your eyes, and also happens to be a good shape to turn into a kitty face. She filled hers with lavender, chamomile, and lemon balm to aid in relaxation. You could also make this as a rice bag to heat in the microwave to soothe aches and pains. Go to Adventures in Making for the pattern and tutorial.